I get a lot of people telling me that I am creative and that they are not. That they have ideas, but have a hard time fleshing them out and making them work. It makes me sad that so many people have convinced themselves that they aren't creative when, in reality, everyone is creative! I think a lot of times, we get overwhelmed with the task of decorating our homes. We hoard every item we have and feel like we have to keep it all out all of the time. We feel the strain of a small budget. We are paralyzed perfectionists, awaiting that perfect light bulb moment. We convince ourselves that we don't have an eye for design and so we quit trying to get better. We sit on a throne of lies. True, we all have strengths and weaknesses. But weaknesses can be strengthened. Creativity must be nurtured and exercised to grow. It is a struggle for me too. And so, I've decided to start an ongoing series on creativity. 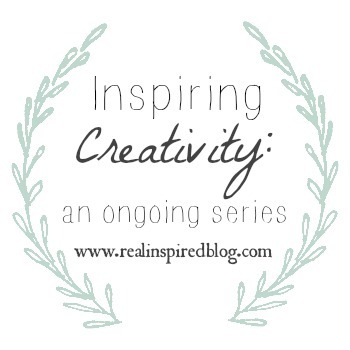 This new series will focus on creativity, tips, inspiration sources, and just going for it! Since it will be ongoing, I'll be posting on the subject from time to time, whenever the mood and inspiration strikes. I hope you will follow along and be inspired. Not just by pretty pictures that aren't realistic, but that you will truly be inspired to, in the immortal words of Ms. Frizzle, "take chances, make mistakes, and get messy!" Because that's what real life inspiration is.